Show Starts at 8:45 pm. New Night! - Saturday, January 13 at 9:00 PM, $10.00 cover. I will be hosting; Featuring Jennifer Myskowski, Desi Walker is headlining. 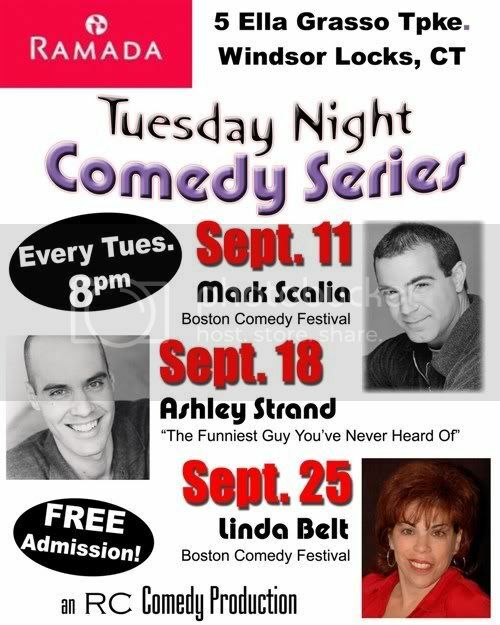 Show starts at 9:15, Call 860-747-1100 for info. I will be appearing at this fabulous show that will include the incredible talent of Jim McCue and Max Dolcelli: Two heavy-hitters in the biz! Check out Jim's Website at www.jimmccue.com or search google for Max and more information on these two nationally-known headliners! $36 per person, includes dinner and show. Other patron pricing available. Call for details. 860-236-1275. 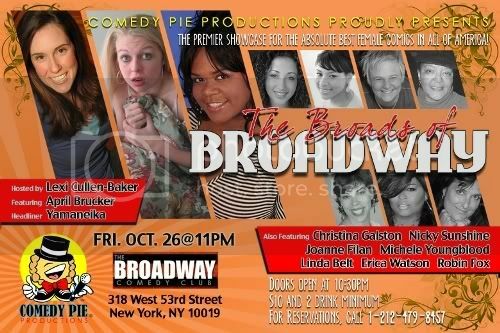 All women's showcase: featuring Ann Podolske, Jennifer Myskowski, I will be headlining! $10 cover; Show starts at 8:30. Thanks to Dan Paquette for booking the gals! This is a Mom's gone WILD weekend and I'm the entertainment Friday night. Watch out, after my visit, Vermont will be known for more than just their maple syrup!! Leave the kids and hubby home and come join us for this BLAST! I'm going to the dogs again! I'm emcee for the JCC "Canine Fashion Show", benefiting the special Needs Program. Crafts, Prizes and catered brunch ( by reservation). 11:00-1:30, tkts. $36.00 general, $72 Donor and $118 Angel. call Ilene Schloss @ 231-6355 for tks and info. Angel Rentas and Max Dolcelli performing, special guest Dr. Jay Sutay, I'll be hosting. Tickets are 16.50 each or 2 for $28.00. Private Show w/Jason Andors, one of HBO's "bad boyz" of comedy! Private Show: I will be performing with Jason Andors. call Marlborough Tavern (860) 295-8229 for more information. Featuring Jennifer Myskowski and Angel Rentas. Guest spot Mike Lemme. I'll be hosting. 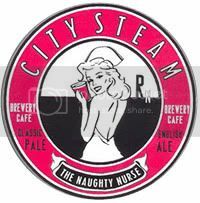 Saturday, April 21 at 9:00 PM, $10.00 cover. 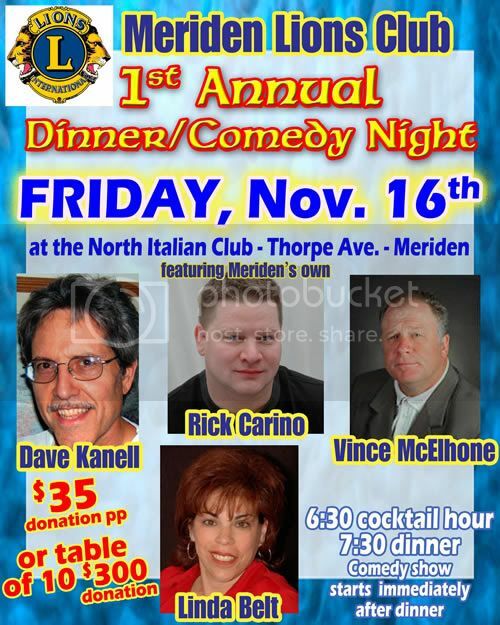 Featuring Dan Paquette, Rick Carino and Mark Scalia is headlining. 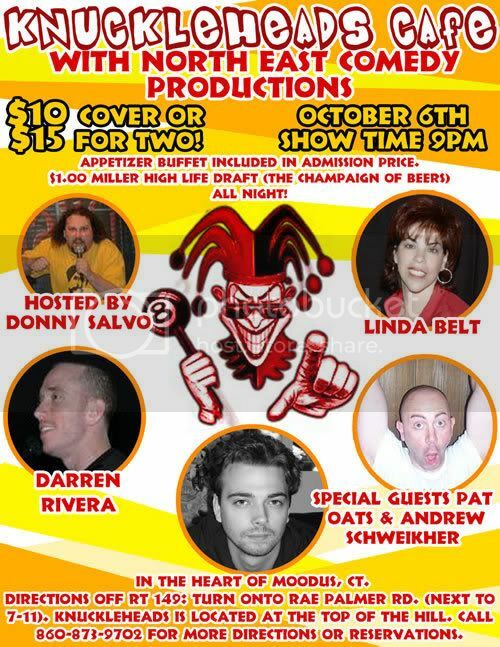 Featuring Darren Rivera, Angry Bob and Artie Rob. I will not be performing at the show. 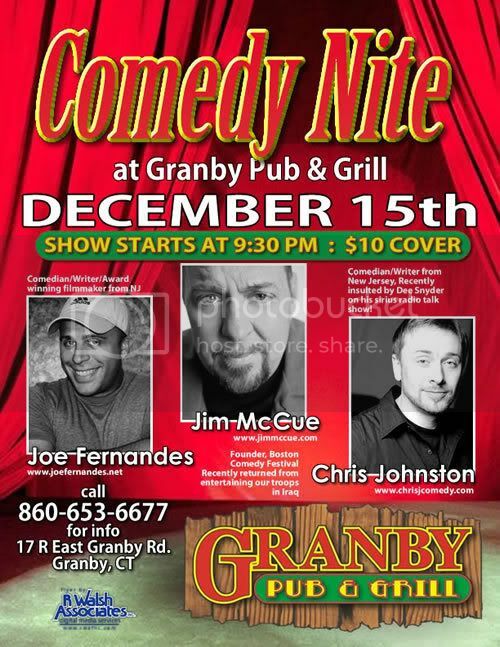 while the fabulous show in Granby is going on , I'll be in NJ for a bachelor/ bachelorette party. They wanted someone who's married..why? by the time I'm done with them they may call off the wedding! I'll be hosting, 8:15, $10 cover. 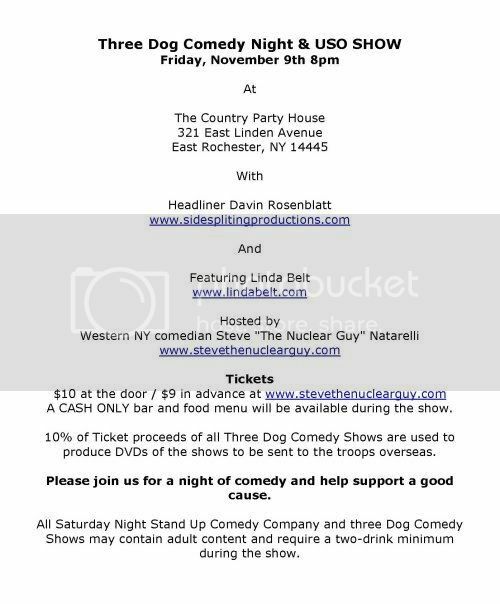 860-653-5050, with Jessie Baade, Max Dolcelli back by popular demand, headlining, feature comic Sheila VanDyke, guest spot Luke Foster. update: special guest from Toronto, Ruby, who' s in town for the Valley of Laughter Comedy Festival! I'm the guest, see comedy clips throughout the show! I will be in New Jersey and will be stopping by to do a guest spot at this show! I will be a guest on the Mary Jones show before my performance at the Funny Bone tonight! 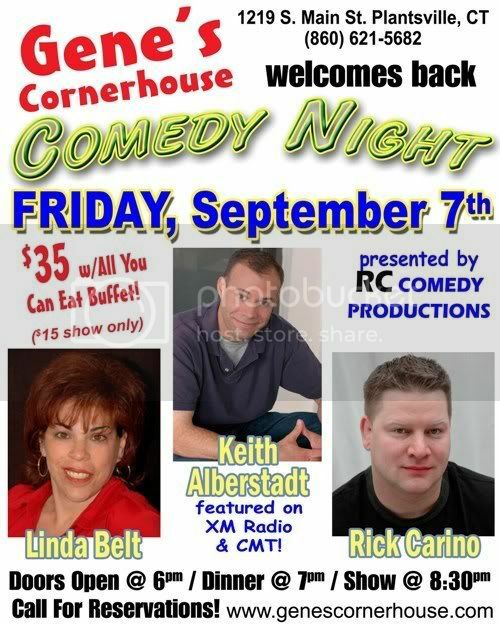 Just stoppin' by to do some time, my buddy keith Alberstadt headlining. I will be performing as featured comic for this show! 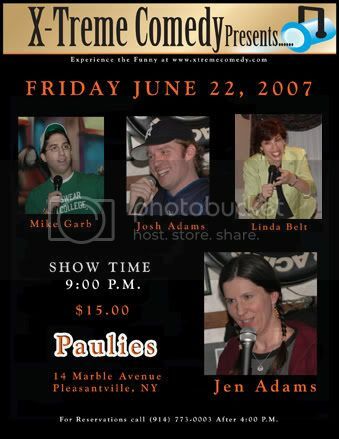 9:30 show, $10 cover. 860-653-5050. I'll be featuring, headliner TBA but they'll be fabulous. Always a great show here. 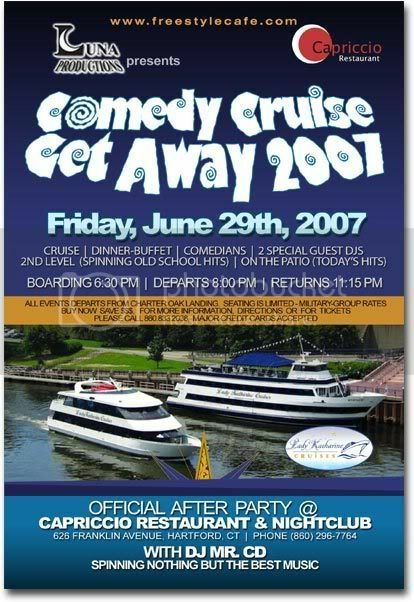 : I will be performing with two of my favorite guys in comedy, Artie Rob and Marshall Brandon on one of the CT River Boat Cruises. 8:30 pm. Come on by, it's Tuesday night, what else are you doing? Have dinner first in the fabulous restaurant and then step down to stand up in the intimate downstairs room. Featuring, from New Jersey, Chris Johnston, Joe Fernandes. 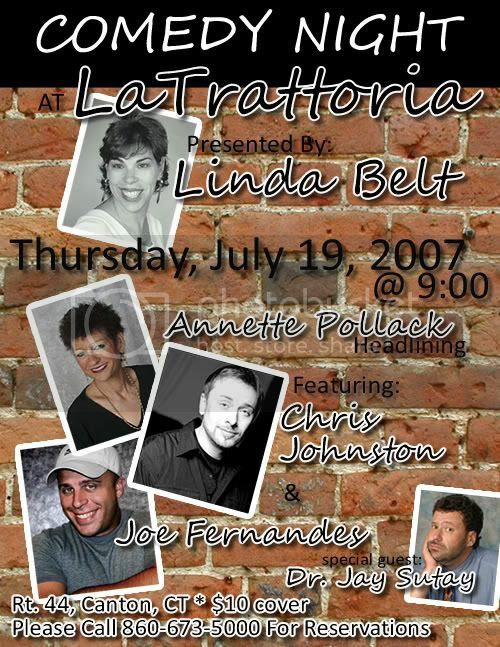 Anntette Pollack from Boston will be Headlining. 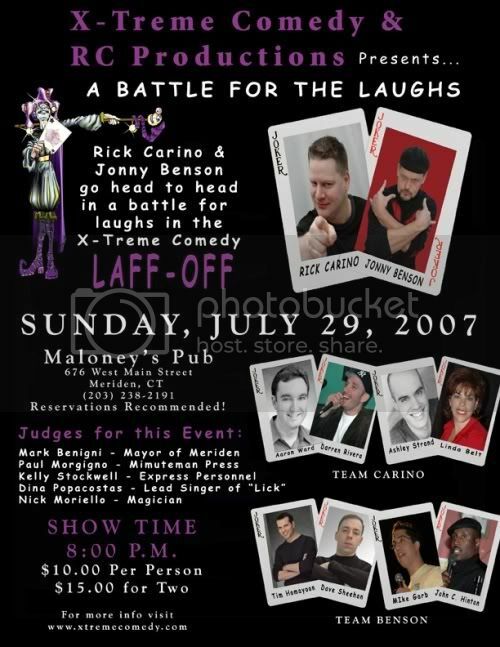 EJ Murphy will Feature & John Turco is the headliner. Hosted by yours truly! 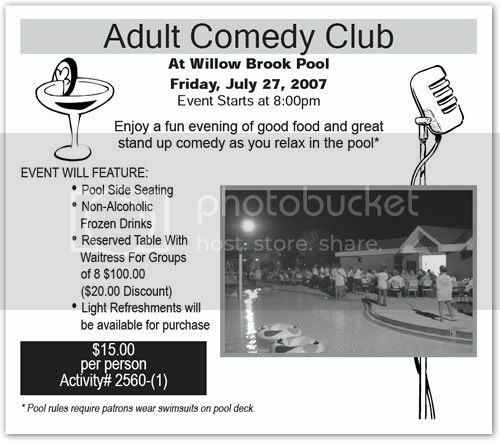 I'll be appearing with the very funny Tammy Pooler! Please checkout the show link! I will be hosting this show during while visiting Beautiful Nova Scotia! * $35 includes an all you can eat buffet. 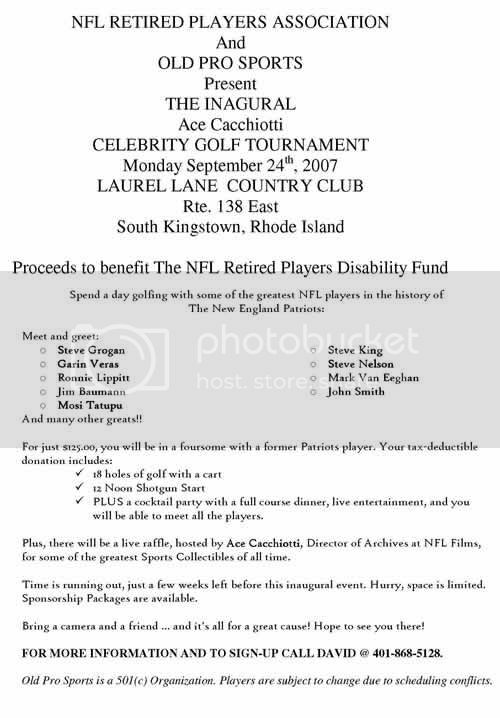 The one and only Rick Carino will be hosting . 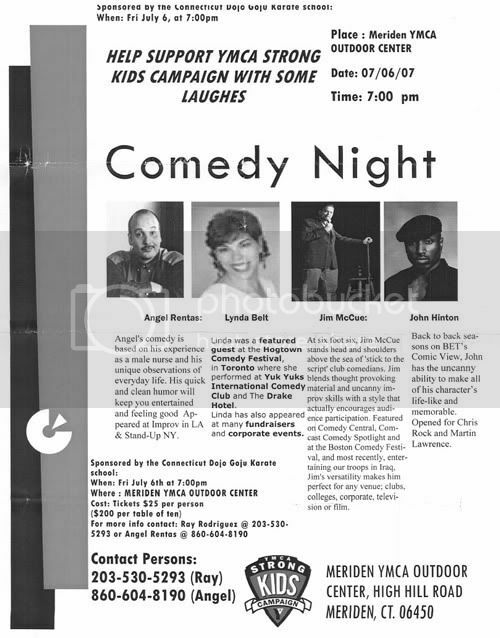 I open for the very funny Mr. Keith Alberstadt. Ahhh, comedy heaven, me, in the middle of these two! I will be performing as the Headliner for this show! Each week one comic gets this gig all to themselves. Better watch out for those insurance executives here in Hartford. Man are they a wild bunch!!!! 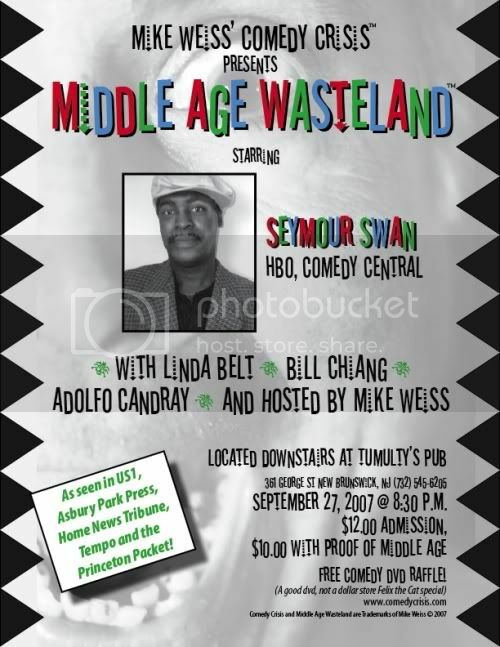 A monthly show presented & hosted by Mike Weiss, a hilarious geezer himself! * discount w/ proof of middle age! 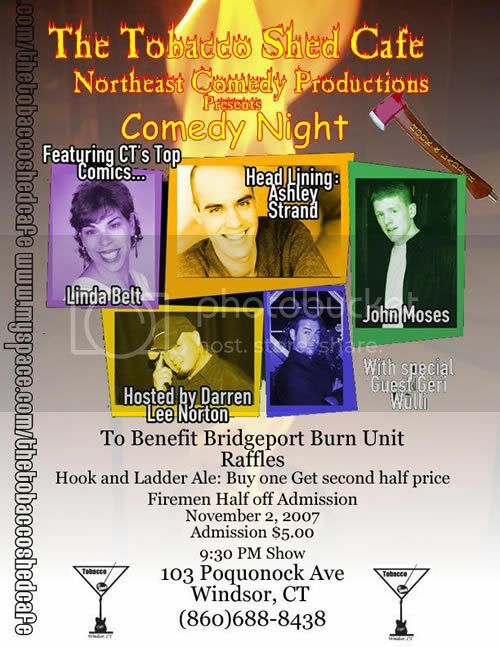 Presented by Mr. Darren Norton of Northeast Comedy Productions- Always a great line-up! Please check Darren out on myspace. featuring Darren Rivera, Michael Kemp. Hosted by Donny Salvo. Please go to the official site for the festival:events/showcases for more info and full line up of comics. Mr. Rick Carino will be stepping in to guest host for me. The girls take over on this show! Produced by Julio Ray of Julio's Comedy Pie Productions. Please check him out-find him in my top friends on myspace! Fundraiser for Interval House. come join us after work (show starts at 5:30) as Darren Rivera hosts this show. I'll be performing with Tracy Locke! 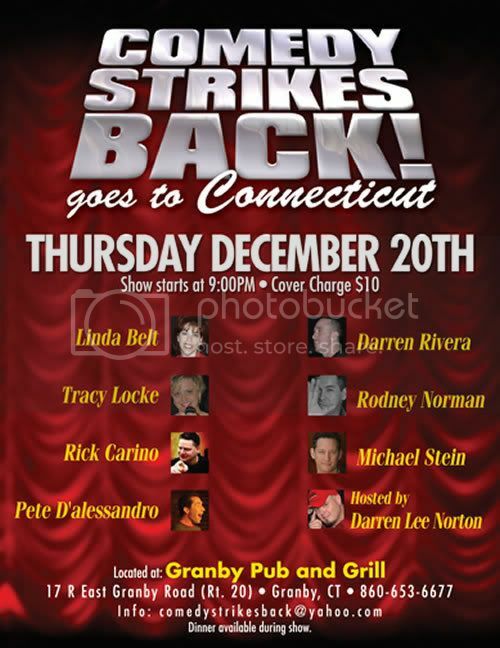 Angel Rentas – Hartford, Ct.
Granby Pub and Grill - Comedy Strikes Back! 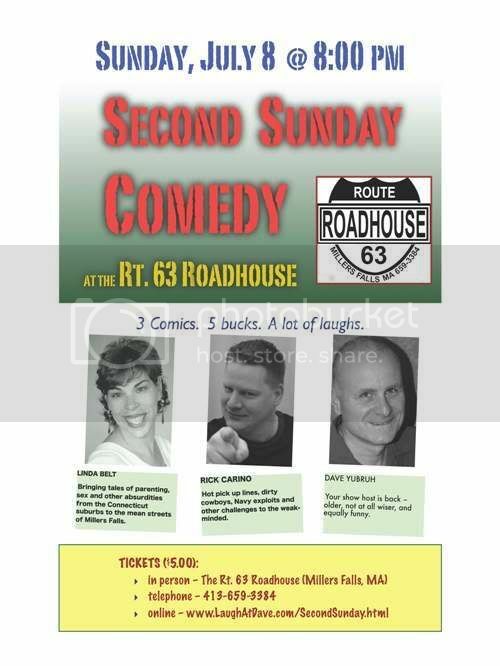 Michael Stein and Pete D'Alessandro will be in from LA performing with a few of us CT comics. Should be fun!